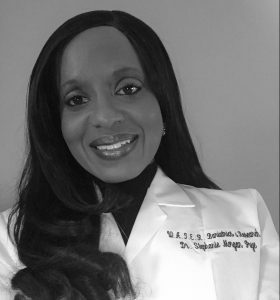 Dr. Stephanie Morgan Frye, a weight management specialist from Thompsons Station, Tennessee, has been awarded National Board Certification by the American Association of Bariatric Counselors (AABC). After completing a specialized training and education program she was recently credentialed as a Board Certified Bariatric Counselor (CBC). Dr. Frye has also published research related to obesity and pregnancy and is currently conducting bariatric metabolic research. Her practice, W.A.T.E.R. Bariatric and Weight Loss Research, located in the greater Nashville area, provides weight-loss counseling for adults and children and also offers assessment and counseling for weight-loss surgery patients. She has also published research related to obesity and pregnancy and is conducting bariatric metabolic research. Her specialized practice has state-of-of the-art metabolic testing equipment that can determine an individual’s actual metabolic/caloric needs. Dr. Stephanie said that, “not knowing what an individual’s metabolic rate is…is like driving a car without a steering wheel”. She earned her B.A. at Tennessee University, her Masters at the University of Phoenix and her Ph.D. from Walden University. The American Association of Bariatric Counseling is an official US Federal not-for-profit, professional fellowship association dedicated to the advancement of bariatric science education and to the enhancement of obesity care and treatment. Founded in 2005, AABC is the world’s largest association exclusively representing professional multi-disciplinary bariatric counselors. Board Certification by AABC affirms that their credentialed fellows are licensed/registered/certified health or education professionals that have completed a specialized academic program in Bariatric Science and must continue their specialized education and training to maintain their Board Certification. This entry was posted in National Board Certifications and tagged National Board Certification, slider2 by admin. Bookmark the permalink.